Experience the best that Spain has to offer by visiting its main cities and regions – Madrid, Seville, Valencia and Barcelona. This eight-day trip includes 4* hotels and many activities that will get you into the swing of Spanish life. Experience traditional flamenco in Seville, a bike tour in Valencia and the chance to visit multiple sights in both Madrid and Barcelona. And of course, if you’d like to customise your itinerary in any way we’re able to do that too. Enjoy an authentic flamenco masterclass at the oldest tablao flamenco in Madrid! A flamenco dancer and a guitarist will show you how to master flamenco: the different songs and music, the dance, the guitar, etc. You will be taught a genuine flamenco masterclass before watching one of the best flamenco shows in town. The next day, take a tour of Madrid, either on a hop on hop off bus or with a private guide. Take the train to Seville. Join a tour which takes you through the heart of the city. Visit the famous Plaza De Espana. Drive through the illuminated main streets, squares and fountains and enjoy a panoramic view of the city on the way to Tablao. Then it’s time for another stunning flamenco show which is found in an old Sevillian Palace from the 19th century in the middle of the Macarena Neighbourhood. Take a train to Valencia where you’ll embark on a bike tour of the city. Valencia is a totally flat city, with lots of green areas and a historical city centre which is easily navigated thanks to the cycle paths and the slow-traffic streets. The Valencia Bike Tour is the different, original, and environmentally-friendly fun tour, starting with the Turia Gardens, the former riverbed that used to wind its way through the city. Later on, you will pedal down the streets, squares and past the main monuments of the old city until you get to Valencia’s newest landmark, the City of Arts & Sciences Museum. Take the train to Barcelona. Barcelona is known as the capital of Modernism and the place where the famous architect Antoni Gaudí worked and lived. Explore the city on an art and architecture tour of Barcelona. 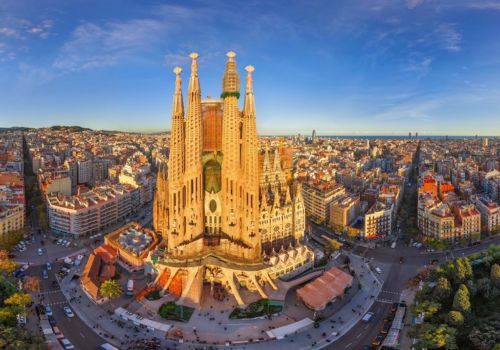 It will take you to the Sagrada Familia Basilica, Gaudi’s unfinished masterpiece which is Barcelona’s most famous landmark. The guide will take you on a walking tour of the exterior of the Sagrada Familia, to admire the richly and symbolically decorated facades. Then, discover Gaudi’s bizarre Park Güell which has been declared a UNESCO World Heritage Site. Be careful, it’s easy to get lost in the whimsical design of this bizarre but compelling public park with a perfect integration of the architectural elements in nature. The tour continues to Passeig de Gràcia to see Gaudi’s famous apartment buildings like Casa Batlló, Casa Mila “La Pedrera” and others modernist buildings.